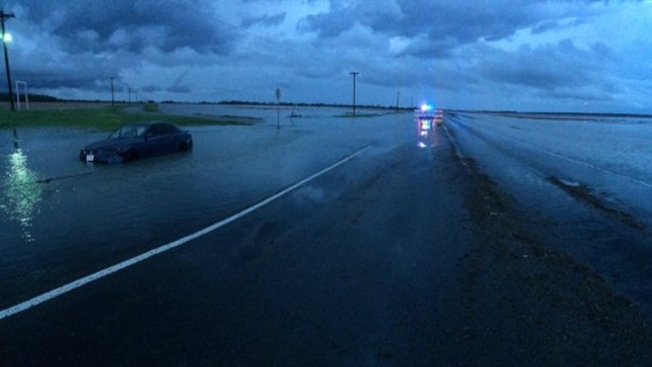 High water carries a car off a road in southeast Navarro County Wednesday morning. Several hours of rain brought a Flash Flood Warning to Navarro County Wednesday morning. The warning was set to expire at 9 a.m.
An area of particular concern was in southeast Navarro County, according to officials with the county's Office of Emergency Management. Water was reported on the roadway on U.S. 287 near the intersection of Farm-to-Market Road 209 in Kerens, on the east side of the Richland-Chambers Reservoir as 4:30 Wednesday morning. At least one driver was washed off U.S. 287. His blue sedan was stranded in about 18 inches of water in a ditch on the south side of the road. The driver was unable to open the door to his car because of the force of the water, according to a Texas Department of Transportation employee who helped the man. Instead, he was able to climb to safety through his driver side window.